Social bookmarking is an easy way for Internet users to store, share, tag and organise your favourite links to web pages or websites on the Internet. 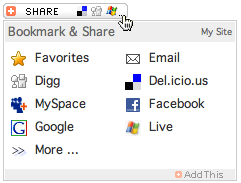 Users can save links to web pages that they want to remember and/or share. These saved bookmark lists are usually public, but can also be saved privately and shared only with specified people or groups if you wish. Most social bookmark services encourage users to organize their bookmarks with informal tags instead of the traditional browser-based system of folders, although some services feature categories/folders or a combination of folders and tags (tags are a way of describing the bookmarks). They also enable viewing bookmarks associated with a chosen tag, and include information about the number of users who have bookmarked them. Many social bookmarking services also provide RSS web feeds for the lists, allowing subscribers to become aware of new bookmarks as they are saved, shared, and tagged by other users. If you want to take advantage of these bookmarks you will first have to register with a social bookmarking website such as Del.icio.us, Digg, Facebook, Google Bookmarks or http://reddit.com/ (there are many others) and register . The URL and page Description will already be entered for you when you log into your bookmarking service, ready for you to add tags, notes and then save it to your list of bookmarks. You can also use the email link to email details of the page to a friend. All the social bookmarking sites are free to use, but each works slightly differently. Once you have registered you should be able to save, organise and tag your bookmarks, and if you choose, you can share them with family and friends and other users too.